Well, I’ll take that challenge. 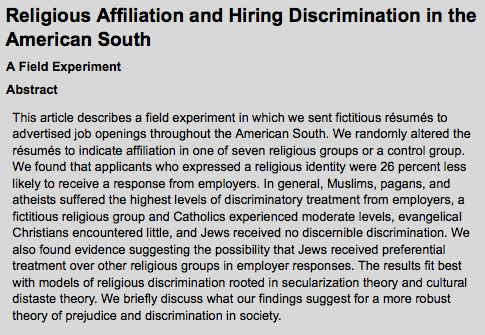 This suggests, ironically, that religious discrimination in hiring is most prevalent in regions of the country where religion is most passionately practiced. What about exploring the researcher’s understanding of the work done by the category religion, for only if you think it names a serene realm of ethereal goodwill would the above conclusion (about the supposedly more religious US south discriminating more than the less religious northeast, which they had studied earlier) be ironic. 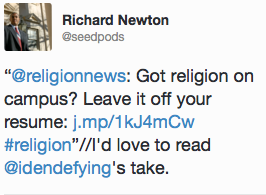 If, instead, that which we name as religion is more like a kin-based form of identity politics, then the above finding isn’t ironic at all. 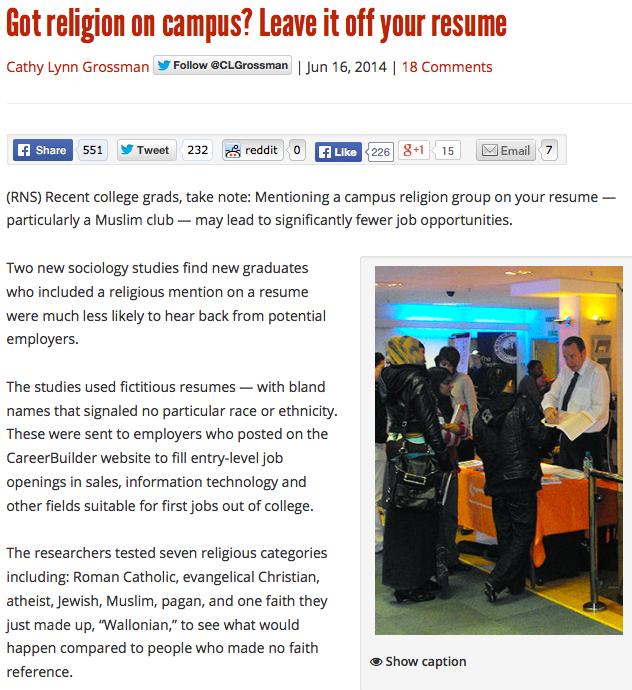 For if we grant the researcher’s assumptions, they found that listing evangelical Christian affiliations didn’t hurt or hamper response rates from prospective employers — but maybe this isn’t news? My point? After just a quick look it is apparent that such research raises far more questions than it answers, for it is not like it uses transparent terms to describe factual states of affairs and social self-evidencies — as such research seems to presume, of course, as do most of those who read either it or who read web articles on it. So, while I’m not sure what other members of our group think of this study, it strikes me as not telling us all that much — other than how the researchers themselves understand social life to be organized and how they operationalize that conception.